GA DOE Statement on Grammar Warm-ups--What Do You Think? I recently received the following email from a teacher in Georgia (and have posted it here with her permission). I'd love to hear your thoughts on either side! "For example, the use of Daily Oral Language (DOL) or Daily Grammar Practice (DGP) does not support the CCGPS language standards. Grammar out of context is a thing of the past." Students must have a basis for understanding grammar, its rules and language, before a teacher can assist with grammar within the context of writing. For example, it would be difficult for me to teach my high school students about the comma splices I see in their Beowulf essays if they couldn't identify an independent clause. Daily Oral Language, M.U.G. Shots, and Daily Grammar Practice give students a short, daily exposure to grammar that takes up less than five minutes of class time, while making sure they are versant in the basic concepts of grammar. This they will need in order to understand the more intricate rules of our language and improve their writing. 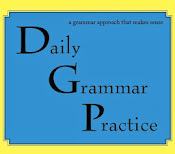 "Daily Grammar Practice is a unique, highly successful, research-based approach to helping students understand, apply, and actually remember grammar concepts. The program is thorough and effective, yet surprisingly simple to implement. Daily Grammar Practice is not "fluffy," and it's not a "quick fix." It is a simple, logical process that actually moves grammar concepts to long-term memory so that students can apply the concepts to their writing." Although the CCGPS does not support "grammar out of context," it does not explicitly deny teachers any one tool in their toolboxes for achieving the goal of grammar-in-context, either. As Ms. Burnette states in her introduction to DGP, such daily grammar warmups actually AID students in writing improvement. I will continue to use DGP in my classroom, and I hope that the writers of the ELA Newsletter will keep in mind that ANY tool can be effective in the hands of a good teacher who knows how to use it to meet her students' needs.